SofTutor is the fastest way to learn! 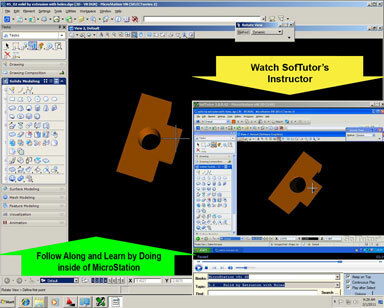 Above SofTutor for MicroStation V8i SS2 3D - Similar lessons are included in this demo. You will be emailed a link to download and try our SofTutor for MicroStation Demo product. Our demo is a 175MB download. This demo is a subset of our SofTutor for MicroStation XM/V8i 2D, SofTutor for MicroStation V8i 3D. This demo contains about 10% of our actual products and is over 60 minutes long. Click here to see a table of contents of what's included. Let us know if you want a demo on an older version of SofTutor for MicroStation (versions 5 - v8 2004.) We've been making products for MicroStation products since 1994. We will not share your email address with any other companies and you will not be added to our mailing list, however, we may email you up to 2 times in regards to this demo product, unless you add our mailing list. We generally never email more than 4 times a year and do not share our names with any 3rd party. All	products	made by New Vision Software, Incorporated are digitally signed using a 4096 bit digital signature from verisign.com and are spyware, malware and virus free. If you're in doubt download the product, right mouse button click on the exe file, select properties, then select digital signature and make sure it says New Vision Software, Incorporated, if it does its safe to install. Only download from the sources below. This product was built using SofTutor v3.1.44 which recieved the Microsoft Windows 7 logo 6/15/2012. SofTutor corporate products are dynamic and change several times a year based on user feedback. This product has been updated to reflect the latest changes to our SofTutor products. Corporate users also have the option of adding their own content or modifying ours to suite their needs for training, support and collaboration. We will not share your email address with any other companies and you will not be added to our mailing list, however, we may email you up to 4 times in reguards to this demo product, unless you add our mailing list. We generally never email more than 4 times a year and do not share our names with any 3rd party. If you have any trouble downloading or cannot install this at work let us know in the comments below, we may add the videos to the website under the online demo section (left side of page) and if so we'll let you know. Do You agree with our demo license?